We celebrated Mass together at the Tomb of St. John Marie Vianney in Ars, France. His incorrupt body is on display! Definitely a powerful experience which further encouraged us to pursue a zealous, holy, and virtuous priesthood. Simply being in such a close proximity to the Vatican is amazing. The view of the Basilica is spectacular at the CIAM. Perhaps I should add that there are seemingly endless churches to visit which can never be accurately represented through pictures. You have to be there to get the full effect; pictures are a pale substitute. We took a short trip to Nettuno to see both the Basilica where St. Maria Goretti’s body remains, and we also visited the WWII Sicily-Rome American Cemetery and Memorial. Both were very moving in their own way. Does eating count? I hope it does. One of my personal favorite things to do when travelling is to try lots and lots of food. There are enough pizza, pasta, and gelato places to keep somebody covered for several lifetimes. Some guys have visited gelato places multiple times in the same day, being the brave souls that they are (but I am not one of them). The food at the CIAM is also fabulous. Taking classes with Fr. Robert Gahl at the Pontifical University of the Holy Cross (AKA “Santa Croce”) during the week was a treat. He’s very intelligent and engaging, and different points of his lectures have been the subject of many conversations and references. Santa Croce itself is also great! I am grateful for the opportunity to be there. One of the things which has struck me spiritually is the beauty of the different churches. 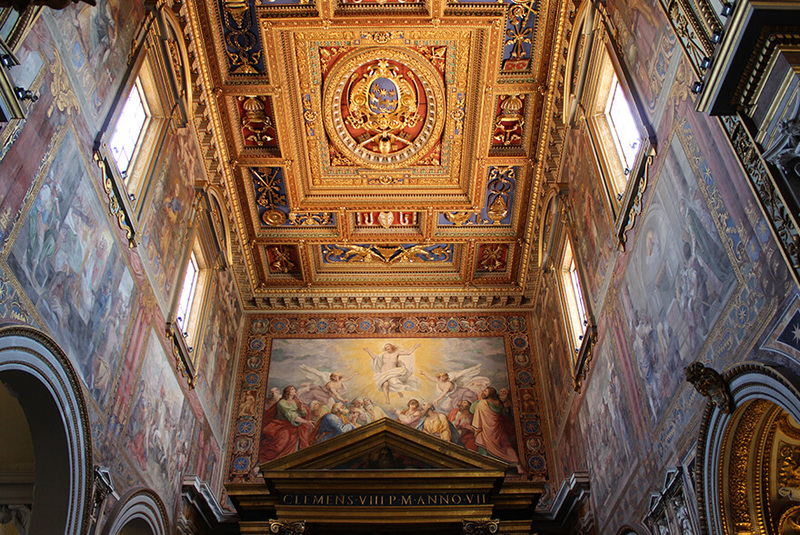 Some have made the comparison that it is like trying to drink from a firehose, given that the sheer abundance of masterful artwork and architecture in these churches is found—in a very real sense—almost everywhere. Yet, even though these churches display some of the highest points of human achievement in beauty, they are little more than childish, drab imitations of the beauty of Heaven. They are no more than fleeting shadows and clouded reflections of the Divine Beauty. Even our own individual dignity as sons and daughters redeemed by Christ far surpasses that of all these beautiful buildings put together. Even when we don’t act in accord with this priceless dignity, everyone still has the honor and gift of the presence of their ever-vigilant, totally self-giving Guardian Angel, whose glory never wanes and whose beauty makes the sun look dim. I pray that we all may behold the beauty of God, the Saints, and the Angels together in Heaven one day!